Keep your board safe with this classic enclosure. 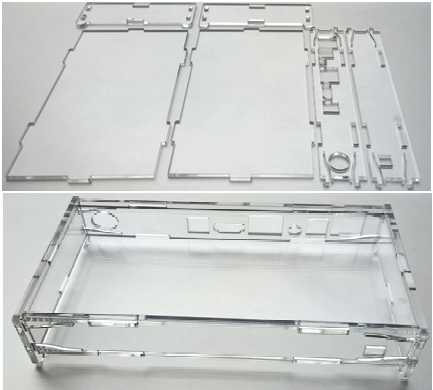 The case comes as 6 pieces that snap together, made of crystal-clear acrylic. The design has no screws or standoffs and there are small feet cut into the sides so that it stands up above your desk. You can use all of the connectors on the edges of the main board: HDMI, Audio, Video, SD card slot, micro USB power, Ethernet, IR repeater port, S/PDIF and the 2 USB ports.